Are Nursing Home or Hospital Patients With a Cast at Risk for Developing Bed Sores? Pressure ulcers, or bed sores, can be serious medical conditions that affect a patient’s quality of life. Though they start as red spots, they can quickly progress through stages to affect the upper layer of skin, underlying structures, joints, tendons, and bone. When ulcers become more serious, they also have the potential to develop into serious infections of the bone, tendons, or blood stream. In rare cases, the complications from a pressure ulcer can be life-threatening. Certain individuals are at a higher risk for developing bed sores. Namely, immobilized or bed-ridden patients are most vulnerable, but those who experience any difficulties with ambulation can develop them. This includes those confined to a wheelchair and those with casts. How are Patients With Casts More Prone to Bed Sores? The constant pressure from being bed-ridden. Bed sores occur from lack of oxygenation to the tissues. When pressure restricts the blood flow and delivery of oxygen and other important nutrients, the skin affected begins to die. 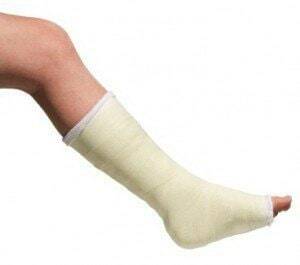 A person in a cast may be unable to move frequently, causing pressure points that can lead to bed sores. A moist wound environment. Moisture is a common risk factor for bed sores, especially when combined with other movement like friction or shearing. Both can occur within the cast area itself, leading to an environment perfect for the development of bed sores. Cellulitis is an infection of the skin and surrounding tissues. It may affect the dermal layers of the skin or fat. It may travel via the lymph nodes to other areas of the body if left untreated. Osteomyelitis is an infection of the bone that may occur if a bed sore occurs in a cast that has a pre-existing surgical wound. Septic arthritis is an infection of the joints or ligaments that is another possible side effect of a bed sore that forms within a cast. Sepsis is a full body blood infection that can be life-threatening without appropriate treatment. In rare cases, untreated bed sores can lead to necrotizing fasciitis, or bacteria contributing to rapid skin and tissue death. In situations where a patient develops a bed sore underneath a cast, it may be a case of improper application or dressing. A provider’s negligence may be to blame for the complications that arise. Keeping the wound and surrounding environment as dry as possible. Providers should conduct regular cast checks and make sure that the wound environment is not conducive to the development of sores. Encouraging patients to shift their own weight and reposition whenever possible. For immobile patients, turning once per hour is optimal. Managing other patient conditions that could put them at risk for bed sores, such as circulation issues, renal disease, and diabetes mellitus. Patients in casts may be at an elevated risk for bed sores in a hospital or nursing home setting. Thankfully, health care providers can help prevent them from occurring through use of conservative measures.